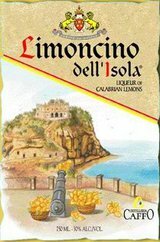 Limoncino is an infusion of the fragrant and aromatic zest of Calabrian lemons. It is made with strict respect to the time-honored traditions of the Calabrian recipe and ideal chilled on its own or in special martini's. Flavor and color is 100% natural.